Category Archives: Let’s Read! Let’s Move! ED’s Let’s Read! Let’s Move! 25th Anniversary of the ADA. 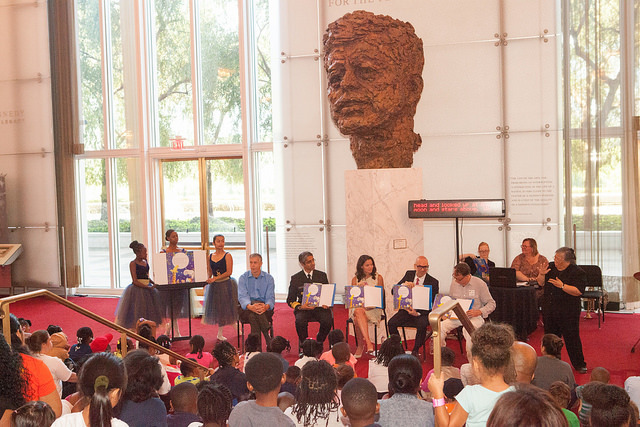 Over 140 children from various organizations, including the Beacon House, Edward C Mazique Parent Child Center, Lollipop Kids Foundation, Friendship Public Charter School, Montgomery County Public Schools, and Kingsbury Day School, filled the Grand Foyer and Opera House steps of the Kennedy Center where they learned that anyone can participate in the arts. This was especially evident through various guests and performers throughout the day. A trio of ballerinas from the Washington Ballet @THEARC Performance Ensemble gracefully guided Secretary Duncan and his friends into the Grand Foyer. 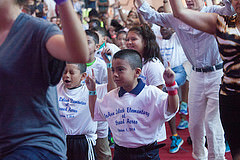 His friends included White House Executive Director of Let’s Move! 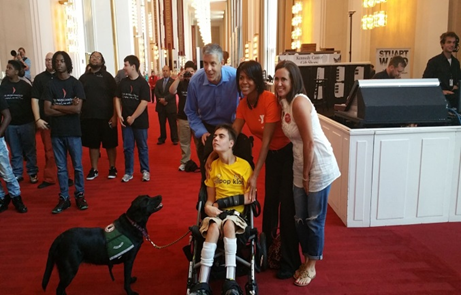 Deb Eschmeyer, Surgeon General Vice Admiral Vivek Murthy, Mario Rossero, Vice President of Education at the Kennedy Center, and Lawrence Carter-Long, a performer in Heidi Latsky’s critically-acclaimed GIMP dance troupe. With the ballerinas holding up large-print pages, they read a book titled Giraffes Can’t Dance by Giles Andreae and illustrator Guy Parker-Rees about Gerald the Giraffe who did not dance like the rest of the animals. However, he learned to dance to his own beat. 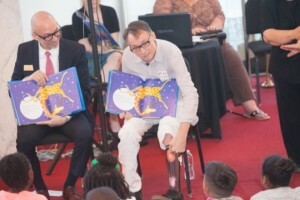 Mr. Carter-Long, an internationally-recognized dancer with cerebral palsy, talked about his connection with Gerald in that they “both had wobbly knees.” He then showed off the brace on his leg. When a child asked the readers “How do you find the right music for you?” he answered, “You’ve got to listen to it and feel it inside of you.” In closing the Let’s Read! part of the event, Ms. Eschmeyer asked the children what they did for exercise, which had many shouting activities such as running, football, basketball, soccer, and dance. Continuing the Let’s Move! portion of the event, Septime Webre, artistic director of the Washington Ballet, helped the children “create a ballet” using everyday morning actions such as brushing your teeth, getting out of bed, eating your cereal, etc. 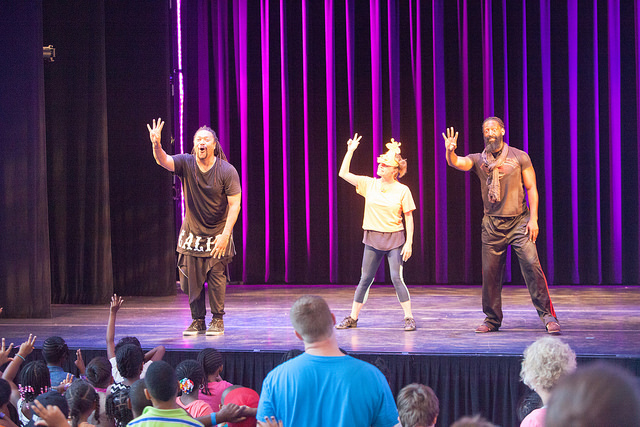 Kennedy Center Dance Teaching Artists, Alison Crosby, Fred Beam, and Antoine Hunter, both of whom are deaf and used interpreters to communicate with the children, brought the event full circle by leading the children in a jungle jamboree, where, following the story they heard, they “waltzed like warthogs, rock ‘n rolled like rhinos, tangoed like lions” and most of all, learned to dance to their own beat, just like Gerald. Connor VanDenBosch is a junior at the University of Michigan. He is serving as an intern in the Office of Communications and Outreach at the U.S. Department of Education. ADA, Disabilities, Events, Let's Read! Let's Move!